Camille Kivette and Florence Olga Kivette Childress, better known as the Kivette sisters, were notorious for their immense loyalty to Elon and for their grand parties. Daughters of P.L. 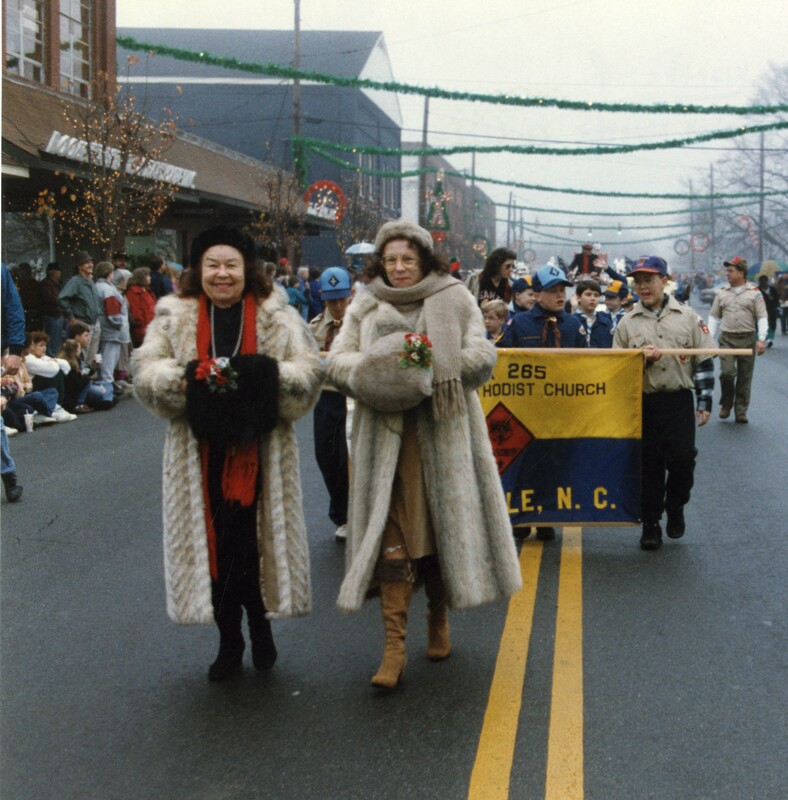 and Annie Kivette and natives of Gibsonville, North Carolina, the Kivette sisters remained an integral part of Elon’s spirit for more than five decades. Vivacious, eager to please, and ever seeking friendship – Florence is conscientious and willing. It’s easy to confide in her, and we believe our confidence is well-founded in a genuine endeavor to satisfy. Florence is ever active, giddily gay, goudily goal-conscious. Camille was born on April 27, 1920 and graduated from Elon College in 1941 with a degree in English. She was the Treasurer of the Fine Arts Club, involved in the Education Club, Maroon and Gold, Honor Roll, and Home Economics Club. Both Florence and Camille went to University of North Carolina Chapel Hill for graduate school, but their allegiance to Elon never faltered. The Kivette sisters were hostesses of extremely large parties held at their colonial mansion in Gibsonville, NC. They never sent invites because the parties were so popular, and several hundred guests would still arrive – from politicians and Congressmen to businessmen and NASCAR driver Richard Petty. They were especially known for their Christmas parties, a tradition which began in 1955. Florence and Camille would begin to prepare as early as late October for the annual event. Their popularity extended beyond their house throughout the region; for example, the sisters led Gibsonville’s Christmas and 4th of July street parades each year. The house was built by P.L. Kivette, father of Camille and Florence, in a cornfield during the Great Depression. The sisters chose to expand the size of the house in the 1960s, adding more space to entertain guests. Both Kivettes were especially fond of furniture, so the development of the house also offered the expression of one of their many hobbies. Other hobbies included architecture, music, and gardening. On June 6, 1965, Florence married James Clifton Childress. It was a huge occasion in the community. Camille said that, “It was the biggest thing that has happened to Gibsonville since the train wreck 20 years ago!” Florence was also entirely pleased at the event – she liked her bridesmaids’ dresses so much that she decided to buy an identical one for herself. A few weeks after the wedding, the dried flowers continued to be displayed in the mansion. The reasoning was so that the people who missed the wedding could come over and still celebrate the joy with the Kivettes. Unfortunately, James Childress died five years later in 1971 after serving in the U.S. Air Force. Even after they graduated, Florence and Camille continued to eat at least one meal a day at Elon because they preferred the fellowship the cafeteria encouraged. The sisters stated numerous times that Elon was their only family. They were also big fans of Elon athletics and the arts. The crowd could always count on the Kivette’s infamous 1965 light blue, run-down Cadillac attending every home basketball and football game. With two reserved seats in McCrary Theater, Florence and Camille also regularly attended events from the arts. People remember them dressed in hats of red and green and sweatsuits, and fur coats and matching muffs. On October 29, 1999, Florence died at age 82. About ten years later on October 2, 2010, Camille died at age 90. They left a major estate gift to Elon University, and their commitment lives on. Colonnades C – Kivette Hall, the dorm which opened its doors in the Fall of 2011, is named after the sisters and their additionally supportive parents.